You might be a shopaholic and not even realize it. Just because you don’t have a house piled up to the ceiling with junk doesn’t mean you don’t have a shopping disorder that affects your life to the point you need help. In fact, there are probably a lot more shopaholics out there than you may realize. You probably know a couple of them. You might even be a shopaholic yourself. So how do you know if you’re a shopaholic or have shopaholic tendencies? In this article, I’ll show you 4 signs that will help you recognize if you're a shopaholic. I'll also provide you with 4 tips to help you overcome overshopping habits that may be affecting your life. Are you constantly looking to get a new credit card because your others are maxed out? Taking cash advances on one card to make a payment on another? If so, then you may be a shopaholic. When you never have any cash and can’t put money into savings, investments, or an emergency fund, that may be a sign that you’re consuming too much. Overshopping has the effect of draining away all your money, digging your debt hole deeper and deeper, and robbing you of your financial future. Maybe you had a bad day or you’re just feeling a little depressed, stressed, or lonely. You want to buy something to lift your mood a little and brighten your day so whatever is going on in your life doesn’t get you down. Shopping actually can have a mood elevating effect, but just like Meth or Cocaine, it’s a temporary high that has consequences far beyond the short lived mood booster that shopping may provide. There is no such thing as “retail therapy”. It’s a phrase that sounds cute, but that kind of thinking can have consequences that are difficult to deal with. Lying to your spouse and constantly arguing about money and spending may be a sign that your shopping habits are out of control. Shopaholics often hide purchases and lie about spending so they can avoid confrontation. This causes a lot of stress in the overspender. A lot of worry, shame, guilt, and remorse come with the lies and lack of self control. 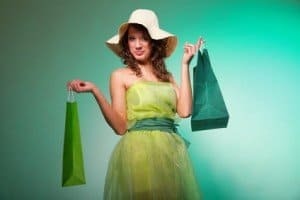 Many times a shopaholic will end up in divorce because of the dishonesty and unwillingness to recognize there is a problem that needs to be corrected. Unfortunately for some people, the hold is so strong that they choose divorce over changing their ways. If you're a compulsive shopper, you may have an overwhelming urge to buy something when you don’t need it or can’t afford it. The urge might be triggered by stress, a sale, a special offer, or any number of circumstances that can trigger a shopaholic brain to act out in an irrational way. And when the urge hits, you may go out with the intent to purchase one item, but come home with a trunkful of junk you didn’t intend to buy. If you recognize any of these signs in your own life, you should take action now to keep from ruining your life in a major way. If you’ve seen any of these signs in your life, chances are overshopping is already taking its toll and you need help to overcome it. Make a detailed plan for each shopping trip. Make a list of only items that you need, and stick to that list no matter what. If you see a sale for something that’s not on the list, it doesn’t matter- stick to the list! Making an unemotional list at home and committing to it helps you overcome some of the emotions that can take hold when you get in a shopping environment and see all the great marketing that urges you to buy, buy, buy. Some people like to go to garage sales, malls, boutiques, or even browse shopping sites on the internet just for “enjoyment”. But if you can’t make it out of that environment without buying something, you should realize that just being there is a temptation. You need to stay out of those locations that tempt you to make unnecessary purchases. Find other ways to pass your time like reading a book, pursuing a hobby, volunteering, or anything positive that keeps you away from the tempting environment that helps trigger problem spending. Developing healthy new habits is key, and one way to do that is to get rid of the credit cards and use cash only when you go shopping. When you use cash along with a shopping list you’re committed to, it allows you to keep control over your spending. When you leave the credit cards at home, you can’t spend more than you have and dig your debt hole deeper. Going cash only allows you to develop discipline in your spending where you didn’t have discipline before. Overshopping can be a very emotional issue that’s difficult to tackle on your own. The roots of a shopaholic disorder can run very deep and have origins in life problems that have nothing to do with shopping at all. If you’re battling overspending, it’s wise to be accountable to someone who is willing to help you through your issues. The best type of accountability to seek is through counseling with a professional counselor who knows how to deal with shopping disorders. In addition to professional counseling, I also recommend seeking additional help from your pastor, a responsible friend, the Bible, and even a shopaholic accountability group that meets in your area. Question: Do you know anyone whose life has been negatively impacted by compulsive shopping? Leave a comment and tell me about it. 7 Habits of Wealthy People That Will Make You Rich Too!